What does it mean to “get FISA right”? 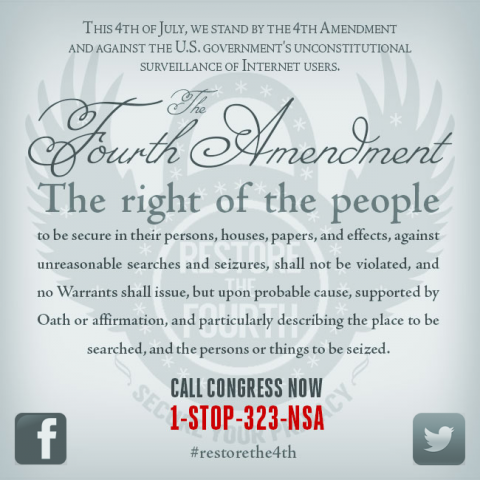 As a member of “Get FISA Right”, I find myself asking, “What does ‘get it right’ mean?” I don’t have a definitive answer, but let me give a few thoughts as a basis for a discussion of the topic. The Foreign Intelligence Surveillance Act (FISA) was originally passed in 1978 order to balance the legitimate need to spy on the nation’s foreign enemies, with the Constitutional rights of her citizens, and especially to curb existing abuse. Technology has changed dramatically since it was written, and our enemies are different. Also, there has been a new round of abuse. All of these must be addressed. Require Executive, Judicial and Congressional oversight when protected and unprotected communications are entangled. Criminalize violation of the Constitution. Item #4 is a knotty one. Since foreign and domestic traffic flows through the same “pipes” and is in the clear, and it is not easy to tell just from the content who the participants are, software that sorts what can legally be captured from what cannot can violate the Constitution and the law if it uses the wrong algorithm or has a bug. This is what the “targeting” and “minimization” procedures are all about. There must be diligent oversight, and it requires esoteric expertise. It requires nerds and Constitutional Law experts. And the jurisdiction to oversee. #5 may seem superfluous, but is important. If your Constitutional rights are violated, you can sue, but only if you prove you have “standing”. If the violation was done in secret, that can be hard to prove. If the criminal law is violated, the Department of Justice and Law Enforcement can and should investigate and prosecute. That’s my framework. What do you think? David Kris’s “A Guide to the New FISA Bill”, Part I, Part II and Part III. This entry was posted on Wednesday, March 4th, 2009 at 12:57 am and is filed under Getting FISA right. You can follow any responses to this entry through the RSS 2.0 feed. You can leave a response, or trackback from your own site. 23 Responses to What does it mean to “get FISA right”? Elegantly simple, but to the point. Do you think the Obama administration would go for #5? Yes, I do, for the simple reason that Obama voted for that very thing last year. This explicitly means that if the acquisition of intelligence violates the Fourth Amendment, then it violates federal law, which is my point #5 above. Obama taught Constitutional Law and having said that the provisions of the FISA amendments included important protections, one can only infer that he supports this language. I believe very strongly that any replacement for the current FISA Act must contain similar language. Great question, Tony. I agree with Jim’s response. What do others think? Thanks for taking the lead on this, Jim, and framing things so well. It’s the best short overview of this complex issue I’ve seen — and the best short bibliography, too. We’re looking for other people to post on “What does it mean to get FISA right”. The ideal format is a post of any length on your blog, and a 500ish word guest post here and on the ideas for change blog at change.org. If you’re interested, please leave your name here in a comment. And if there’s somebody you think would be good, please leave their name here and send them the link so that they can get involved! I caught up with Senator Feingold last Sunday, at his Birthday Party/Re-election fundraiser. I hope you are correct but prior presidents have never wanted to give up any power. We have hints of this from the DOJ defense in court of Bush radicalism. Also in the recent ‘guidance’ given by the WH Council on not requiring Rove, et al to testify in open session under oath. Sorry but I am not sanguine – maybe because I am 72 years old and have been thru this many times. In general, Jerry, I share your concern. It takes an exceptional man to actually strip his own office of power. It is far far more tempting to “use the power to do good” than to set it aside. It’s possible that Obama is that sort of President, but it is not something I would count on. That’s why I work with grassroots organizations like Get FISA Right, and am working with them to push for legislation to restore some of the Judicial and Legislative checks on Presidential power. On the particular question that Tony asked, and FISA in general, I tend to think that Obama will support stronger FISA legislation. If you read my analysis from last summer (#3 in the bibliography above), you will see that my reading of last year’s FISA bill was a positive thing, though far from enough to really get it right, and I take what Obama said on the subject as a positive sign. But, as you say, many of the things that Obama’s DOJ have done suggest that he is trying to preserve some of the excessive power accrued by the Presidency in the last 8 years. And that’s why we, the People, need to make certain that our legislators are active in restoring the balance. PS: You have me by 14 years, but I’ve been working on being something of a curmudgeon myself for some time. As I told my state representative while I was holding her sign out in front of the polling place on election day, I’m an independent siding with the Democrats against the Republicans this time, but they can expect me to turn on them if they don’t actually reform. She and my US Congresswoman both remember me and my views well. One criticism thrown at the current FISA law is that it no longer requires a specific facility (a specific email address, phone number, IP address) to be given in a FISA address. The obvious reason to drop this requirement is that warrants should be for people, not equipment, and in this day and age a temporary address can be picked up for one shot use. Prepaid phones are common, IP addresses are assigned by DHCP in coffee-shops. MAC addresses can be changed. You can sign up for a web-mail account in minutes. Warrants tied to specific facilities can be easily rendered useless by a clever enemy who understands how you build a sleeper cell. The 9/11 guys knew how to build sleeper cells. So, is there really any problem with not requiring specific facilities? On the other hand, the new FISA depends upon where someone is and who they are. US persons are protected. Communications within the US is protected. non-US persons outside the US are not. How do you know who someone is and where when you grab an email? I have email accounts in the UK and Germany, and a phone number in the UK. How do you know I’m a US citizen located in the US when I use them? What about the reverse? I haven’t read Lustick’s book, but it seems that he’s got a very good perspective on the whole “War on Terrorism” thing. I’ve been objecting to the metaphor since it was introduced in September, 2001. And on the mischaracterization of it nearly as long. I wrote back in early October 2001, an essay entitled “9-11: America Victorious” (http://www.eldacur.com/~brons/911.html), arguing that we were doing ourselves and the heroes of 9-11 a great disservice by over emphasizing the threat and the succs of the 9/11 attacks. Jerry and Jim B., I am right there with you. The time is long since past, if it ever existed, when it was the U.S.A.’s responsibity to be the single-handed world police force. If there is a need to fight terror globally, it should be done as a global community. I believe that the Bush administration (esp. Cheney) cynically used the fear factor to aggregate powers, and we as grassroots activists need to hold Obama accountable, forcing the issue as necessary, for restoring a proper balance among the three branches. You’re right, it is a rare exec. who will release power voluntarily. POint #5 above, about criminalizing Constitutional violations, is absolutely right. Silly, naïve me, even at 54 years of age (when I should know better), I simply assumed that Constitutional violations were criminal acts. If not, that is indeed the first thing to do, IMHO. I just read your Ref. 3 and understand what you are saying. Yes, your logic is compelling, but there remains a big privacy issue in the mass acquisition process. I really think that mass acquisition should be avoided if at all possible, or at least used only under special circumstances (and the CIA, etc. having been allowed a free hand off-shores in the past is a precedent I would like to see weakened). The first step toward minimizing it (well, I guess the second, after criminalizing breaches of the Constitution) may not be simply a legal matter, but a clearer differential between the “envelope” and the “mail”, so that the identities of those conversing may be determined BEFORE the eavesdropping is done. What say you? Hmmm, I lost my response when I had signed in on 2 Word Press blogs with 2 different log-ins, each with a different E-mail address. Anyway, thanks for the compliment—hope that we have documented some issues, glad to have folks check in with/for updates. I think this is an exciting blog with intriguing subjects. Have you heard about PunchFlix? It’s this really cool broadcasting service that has unique content and it exhibits other channels around the globe. It’s about to have some of the famed shows along with motion pictures that we all would enjoy. Not only that, but it is also planning to offer motion pictures on demand which signifies that we can easily see whatever show or movie whenever we want. PunchFlix is also going to have films and TV programs in different languages. All we have to do is search for it on the internet or download the smart phone app.